I had the pleasure of roaming the foothills of West Central Montana in a golf cart in late July – the beginning of Berry Season. With a good dog and keeping a sharp eye out for bears, we scoured the hills for some of the tastiest natural treats, as well as the lesser known goodies of the dry back country. 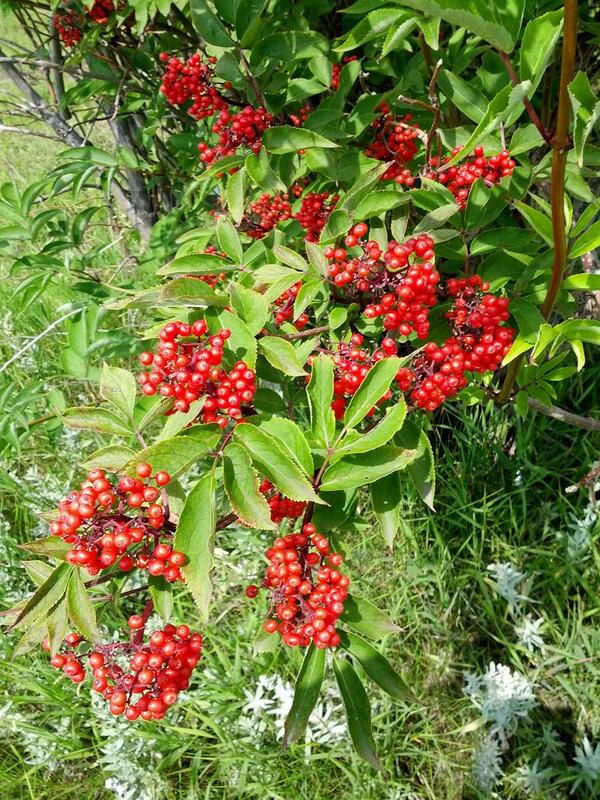 Many of these berries are available all over the Eastern slopes of the Rocky Mountains, including right here in Alberta! Here’s what we found. S. Canadensis and S. cerulea are both found in the Rockies. Last year’s berries, still on the bush. Elderberries are used in wines, preserves, and pastries. The bark and leaves are used in healing washes for skin conditions (eczema), while the flowers are used medicinally in tea. The berries are high in calcium, potassium, and iron, and vitamins C and A. Berries show antiviral activity and are used in teas for colds and flu. Cooking is said to make them edible, although some Nations may also have eaten them raw. The concern in eating the raw berries is the cyanide-producing glycosides in the seeds and the rest of the plant, a common feature of the Rosaceae (Rose) family of fruits and flowers. The flowers of currants have 5 petals and 5 sepals. 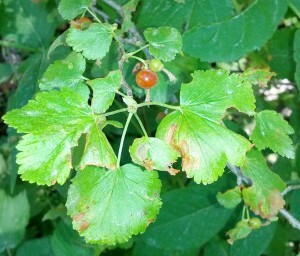 The currant family shares a distinctive lobed leaf, alternate on the branch. 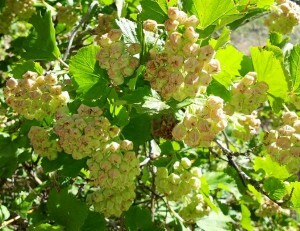 Not all currant bushes have prickly stems (unlike the gooseberry which has prickles). Currants are high in pectin, and can be added to other fruits and berries to make excellent jellies. Wax currants have a pinkish to greenish flower. They are bright orange berries when ripe with the dried flower remnant protruding from the berry. Look for erect bushes 2-6 feet tall with typical Ribes leaf shapes. Harvest time for currants is mid July to mid August. Currants quickly fall off the bush once over-ripe. Currants are said to be a strengthening tonic, and useful against arthritis. 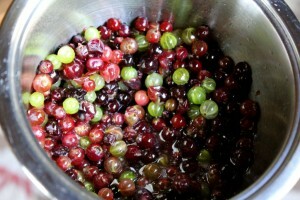 They are used as a culinary berry, making their way into wines, syrups, pastries, and preserves. The leaves and inner bark make a minty flavored tisane that is sometimes used for diarrhea or symptoms of a cold. Tea or jelly from the berries is soothing to a sore throat. The seeds of black currants contains GLA (Gamma-linolenic Acid). Notice the ‘beach ball’ stripes! A member of the currant genus, gooseberries are round with a protruding dried calyx from the flower still attached. 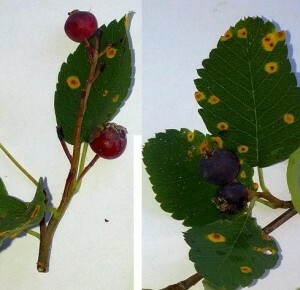 The berries often have ‘beach ball’ stripes or spikes. 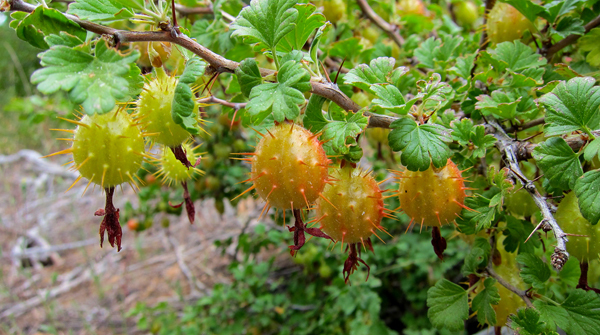 The Spiny-branched shrubs have alternate, typical Ribes-shaped leaves. Tubular flowers white or faintly green, 5 petals, 5 sepals. Gooseberry harvest occurs in mid-July to mid-August depending on region and microclimate. These yummy berries are juicy and edible raw or cooked. They can be picked green as they will ripen off the plant. Some varieties are sweet and others are sour. Wild gooseberries tend to be smaller than the cultivated varieties. A source of vitamin C, gooseberries are useful in colds and sore throats, with good antiseptic properties. Some texts caution against eating too many berries if the currant family is not a routine part of your diet, as stomach upset may occur. Unnamed currant – because we caught this currant bush in between the flower and berry stages, a positive identification is difficult for a non-local herbalist. We’ll be staking out this bush, and I’m looking forward to seeing what kind of berry forms later in the year. My guess is bristly black currant (ribes lacustre). 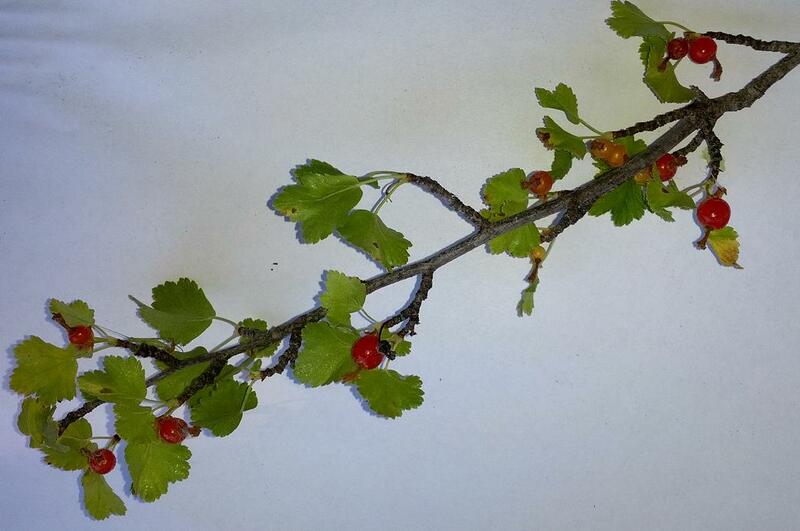 If you can identify this ribes species, please enlighten us with a comment below! Serviceberry, as they are sometimes called in Montana and Alberta, are a sweet and tasty berry that is ready to eat straight off the bush. They are useful in the kitchen in pastries, jams, puddings, sauces, syrups and wines. The boiled berries were used for ear drops while the green berries were used to make eye drops. The juice of saskatoons is said to relieve upset stomach. 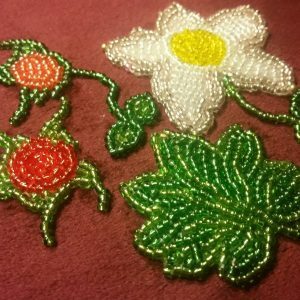 The branches of Saskatoon bushes are said to have been used for a variety of tools, including arrows, tipi pins and stakes, and medicinal lances (1). 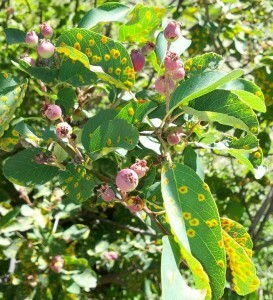 Saskatoons are said to be another source of potential cyanide-like substances by some guides, while others report the free eating of them by first nations. They come to full ripeness between early July and early August, depending on the minute location of each bush. 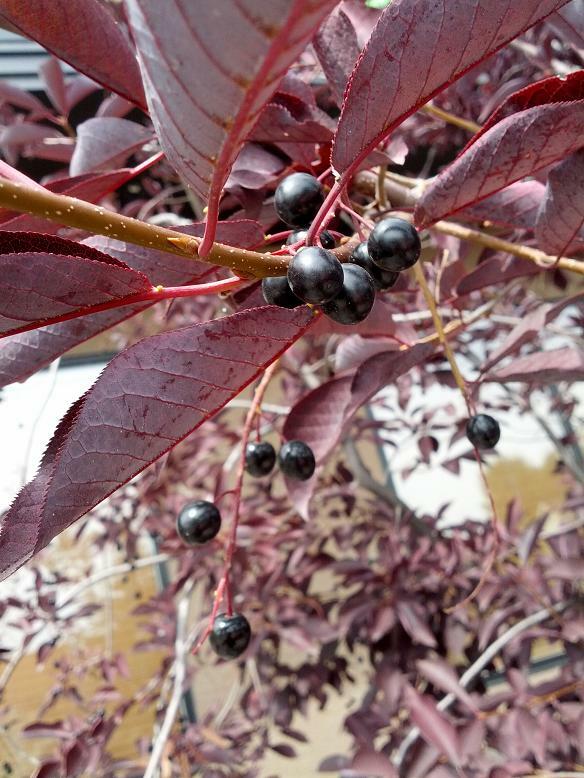 Saskatoon berries were mixed with the sour white berry of the red-osier dogwood to make a desert known as ‘sweet and sour’. This saskatoon plant has been heavily bitten by insects. Our master gardener tells me they are still good to harvest! Compare red, unripe berries with fully ripe purple ones. These ripe chokecherries will be even better, after the first frost. 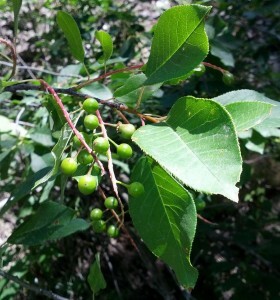 In the foothills we have a few varieties of chokecherry, all used in a similar fashion. 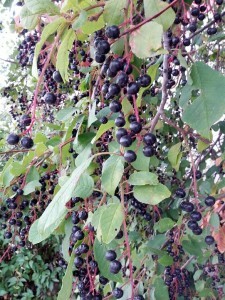 Chokecherries are often found as a small tree, but can also be a tall and leafy bush. The leaves are shiny, deep green or purple, and ovate. The berries hang alternately on a raceme, making them easy to pick by sliding your fingers down the end of the branch and allowing them to fall into your basket. The dark purple fruit becomes ripe in mid to late July, but is best collected after the first frost for sweeter berries. 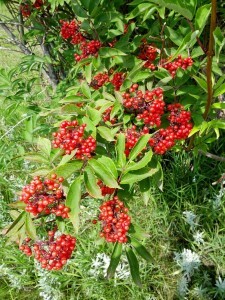 These were an important food berry for many first nations. Dried into cakes in old days, they are now cooked into jams, syrups or made into wine. The astringent taste of the raw berries dries out the mouth and throat, giving them their name: ‘choke’ cherry. 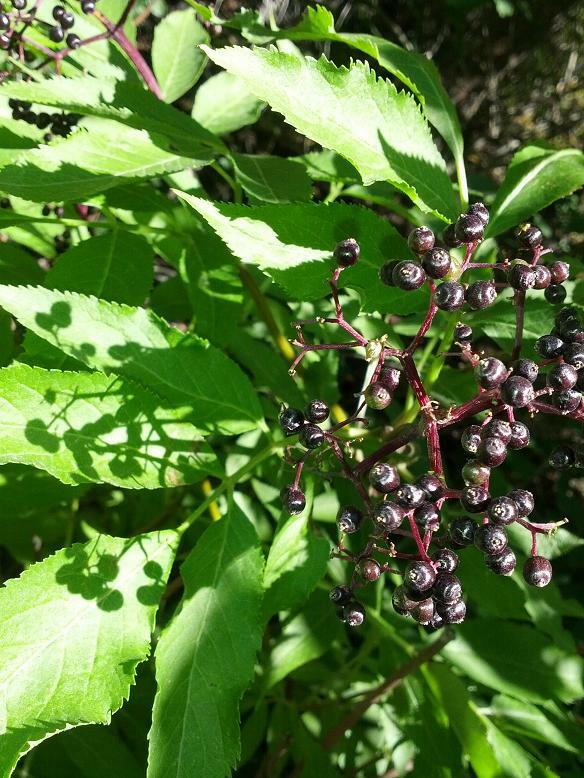 These sour berries improve appetite and dry up loose or bleeding bowels with their astringency. The stone inside the chokecherries is removed in most modern day use due to the presence of hydrocyanic acid in all parts of the plant except the flesh of the fruit. However some first nations report pounding and drying the berries whole, consuming the entire fruit in moderate quantities. Chokecherry bark and unripe berries have traditionally been used to bring relief from stomach upsets and diarrhea. 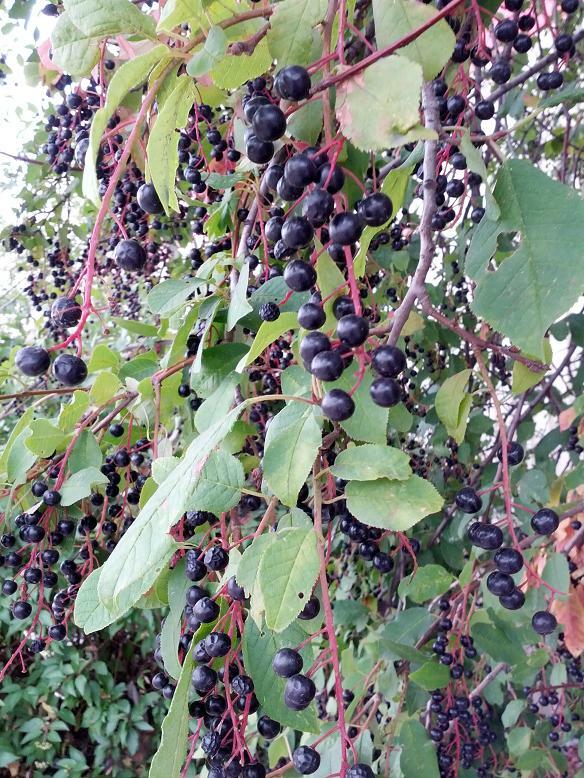 Chokecherry inner bark is used in heart and lung problems, as a diaphoretic, as a steam or smoke in asthma and bronchial congestion, and occasionally in small amounts in cough medicines. 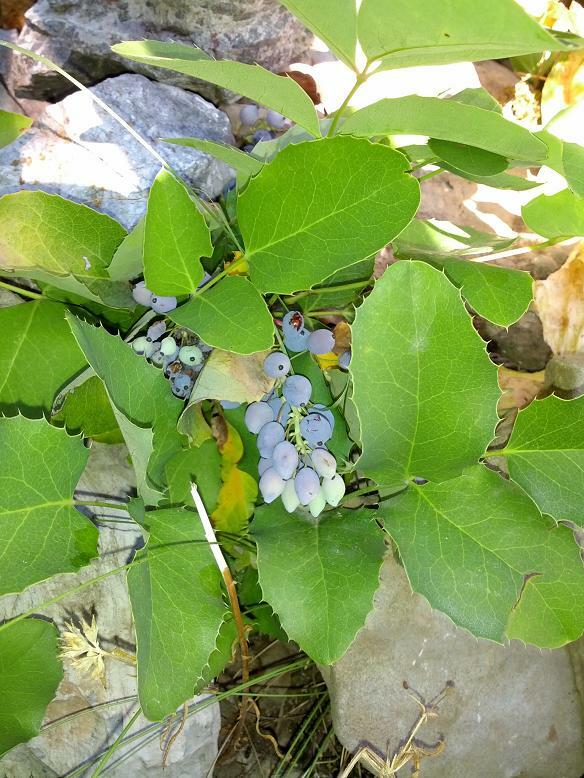 These pretty blue berries may grow in large grape-like clusters, or in small groupings of only 3-10 berries, depending on the year, and the size and location of each plant. Both prostrate barberry (M. repens) and the bushy variety (M. aquifolium) grow in the dry foothills. The berries are very sour. The leathery, spikey-toothed leaves are most easily recognizable at a distance by their second-year leaflets, which turn yellow, orange or even bright red in the winter and may remain so all year. 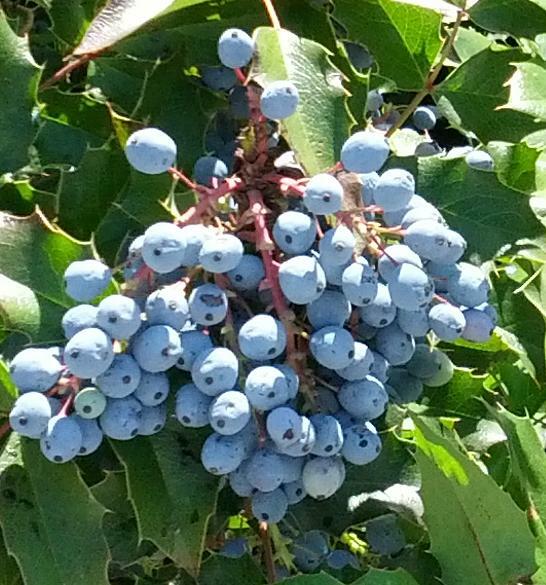 Oregon grape was not popular as a food berry with first nations until sugar was introduced, making the berries more palatable. A desert was made by mixing Oregon grape berries with sugar and milk. The roots of Oregon grape are famous for their yellow alkaloid berberine, a blessing for those suffering from dysentery, kidney troubles, and as an antiseptic for other infections. 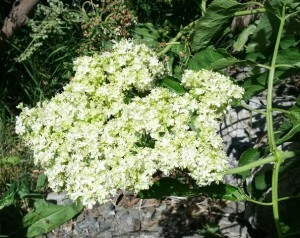 Shrubs can be 1-5 feet tall, with shiny leaves and pinkish urn-shaped flowers. The stems are red with a longitudinal groove. The berries are gathered in late July to early September, and are deep blue to black, about ½ inch in size. 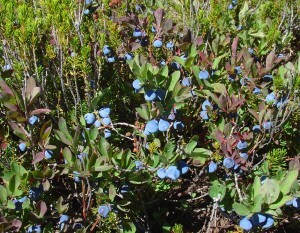 Similar to his cousin the blueberry, huckleberries are not so easily cultivated and so prized as an exotic, wild treat. The location of huckleberry hunting grounds are a closely guarded secret in the rocky mountains, even among neighbors, and the ripe berries are featured in tourist traps and farmers markets at wonderful prices ($10 per half pound this summer in Missoula Montana!). 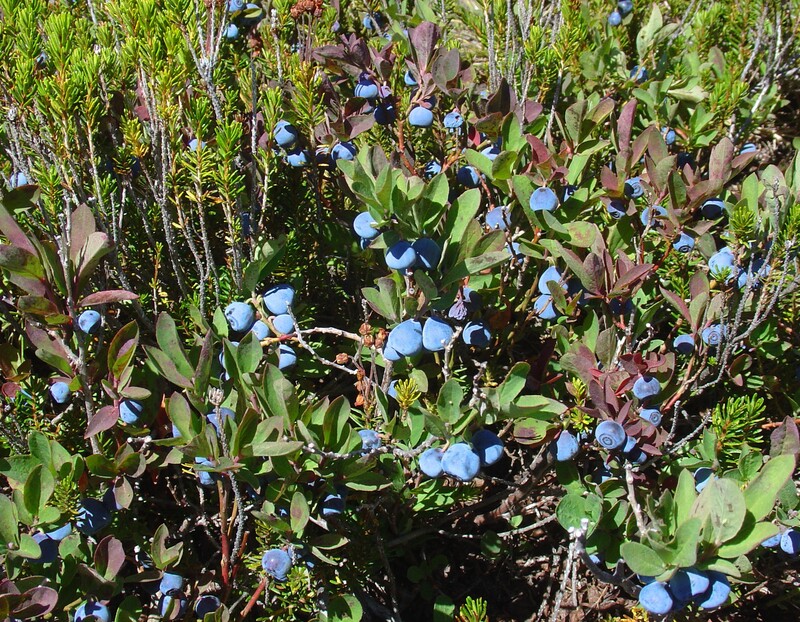 Eaten fresh or dried, huckleberries can be treated like a blueberry for all culinary uses. A tea of the leaves is used by some to stabilize blood glucose levels, reducing the need for insulin in some and treating hypoglycemia in others, as per the need. The leaves are also said to be useful in urinary tract infections. A tea of the roots and stems was used by the Flathead Indians as a medicine for rheumatism, arthritis, and heart issues. Didn’t see the berry you were looking for? There are so many wonderful edible treats in the foothills I couldn’t fit them all in one blog, and plan to write about some of them later. 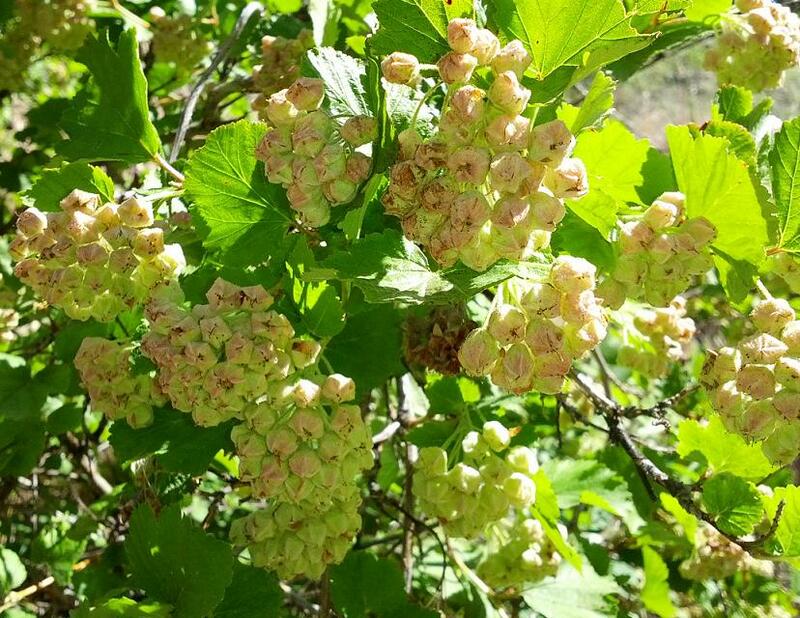 Look out for Part II of Berries of the Foothills, featuring Buffalo berry / “Indian Ice cream”, Red Willow berry, Juniper, Thimbleberry, Bearberry, Snowberry, Mountain Ash and others! Wonder if that might be hawthorn berries forming. Just a guess from the shape of the clusters. 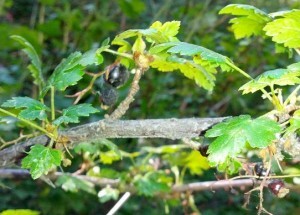 Maybe black hawthorn. Seems like the leaves are kinda like a that too.. but the bushes have big thorns. Keep an eye out for particularly delicious and large sized Ribes aurem (golden currant) also. Berry colors from orange to purple/black. I’m very interested in growing those and would like to obtain some selections with exceptional qualities if you should happen to chance across some. Just thought you might want to make a correction on the huckleberry entry. 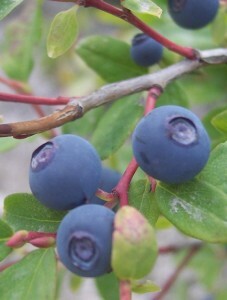 The ” Huckleberries ” of the Northwest and western Montana are not the same as the eastern “Huckleberry” Gaylussacia baccata. These western Montana berries would be genus Vaccinium… possibly V. membranaceum. Another one mentioned on a webpage as popular in Montana was Globe Huckleberry, or V. globulare.